One of the advantages that 401(k) plans have over Individual Retirement Accounts (IRAs) is the ability to borrow against your savings. Specifically, loans are typically not permitted from IRAs or IRA-based plans (SEPs, SARSEPs and SIMPLE IRA plans, etc. 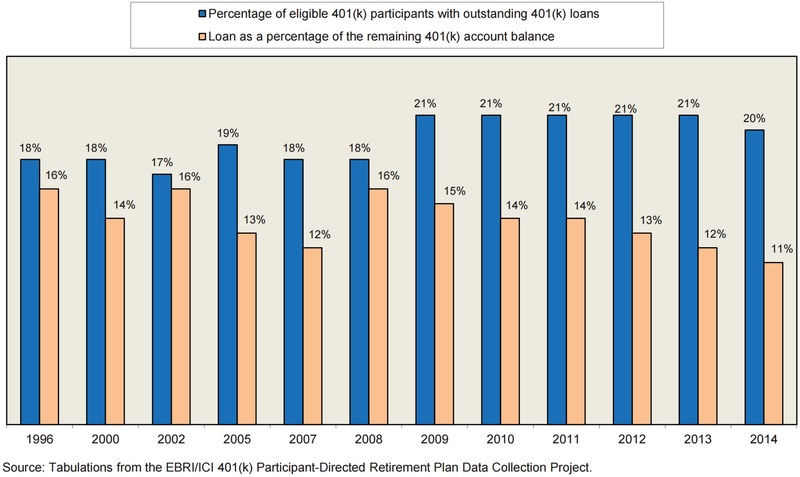 ), apart from the 60-day rollover “loophole.” 401(k)s, though, do allow for flexible loans and a new joint study from the Employee Benefit Research Institute (EBRI) and the Investment Company Institute (ICI) found that 54 percent of 401(k) plans in America offered a loan provision to participants in 2014 (most recent data available). 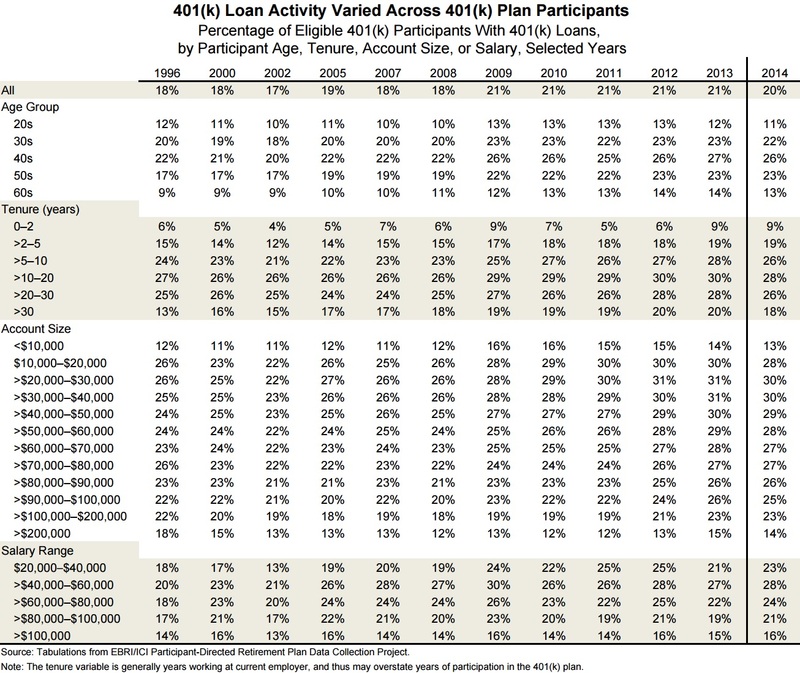 The inclusion of such a loan feature was significantly more common among large 401(k) plans with numerous participants, and loan activity was also found to vary by plan size. For example, 18 percent of participants in 401(k) plans with 26 to 100 participants had loans outstanding in 2014, while nearly a quarter (24 percent) of individuals in plans with 10 or fewer participants had borrowed from their 401(k) assets during this same period. 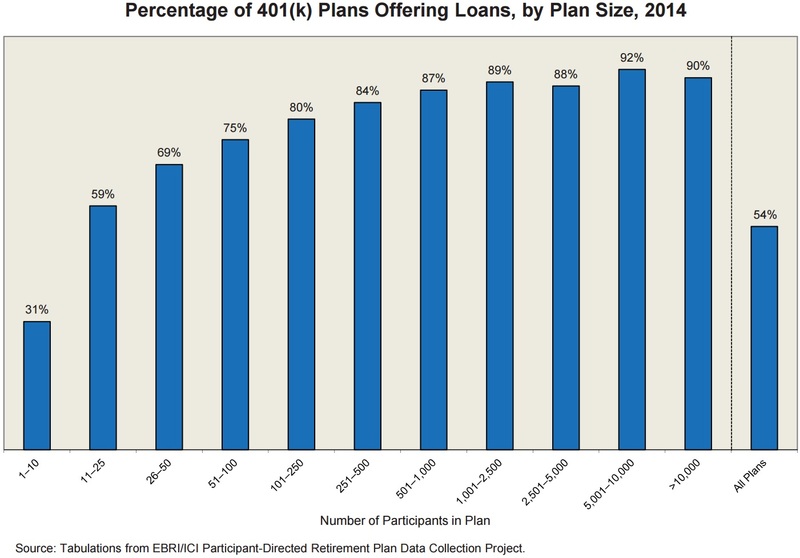 Plan size appeared to have less of an effect on loan ratios because the amount of a loan outstanding divided by the remaining account balance averaged 13 percent in plans with 500 or fewer participants in 2014, compared to 11 percent for plans with more than 5,000 participants. Loan activity also varied with age, tenure, account balance, and salary. Overall, though, 20 percent of the 401(k) participants who were eligible for loans in 2014 had loans outstanding against their 401(k) accounts, and the average unpaid balance was $7,780. Both of those figures are higher compared to 2008 when the economy was still in a recession. While having the ability to borrow from your 401(k) plan can definitely be useful in the event of an emergency, e.g. an unexpected and significant medical expense, it is generally a good idea to never touch such savings until you are actually ready to retire. Indeed, 401(k) plans are intended to help participants amass a significant retirement nest egg through routine, tax-advantaged contributions and the return generated from properly investing those savings. Taking a loan out from your traditional 401(k), though, can have a negative impact on your financial future by lowering the amount of assets that can be invested and therefore diminishing the potential growth and tax benefits. This is especially true for 401(k) loans used to help purchase a home since the amount borrowed in such situations is typically large and paid off over a relatively long time horizon, thus having a more outsized effect on one's retirement assets in terms of missed growth opportunities. A related study out last year from the Pension Research Council at the Wharton School found that employer loan policy appears to play a big role in borrowing behavior because the probability of having an outstanding loan was found to almost double when a plan a participant is in allows for multiple loans. In such situations, the aggregate amount borrowed was found to rise by an average of 16 percent, and all of these findings support similar research from Fidelity Investments on how 401(k) loans can lead to “serial borrowing.” As for actually paying back the borrowed funds, the Wharton study found that 10 percent of 401(k) loans are never repaid in full and that job changes appear to be the most common explanation.